We keep feeding the flames of fishing in our house! My husband used to play a game called Fishin’ Time (made is 1986) with his family when he was a child. We looked online and found one listed on Amazon for $77! This was a bit steeper than we were willing to pay so we found a great used one on Ebay. It arrived yesterday and tonight we played it four times in a row. So far so good, I just wish I would stop dropping my tackle box over the side of the boat and leaving my lunch in my car! To win the game you have to have the heaviest weight of the fish you have collected. We played for 10 minutes a game. 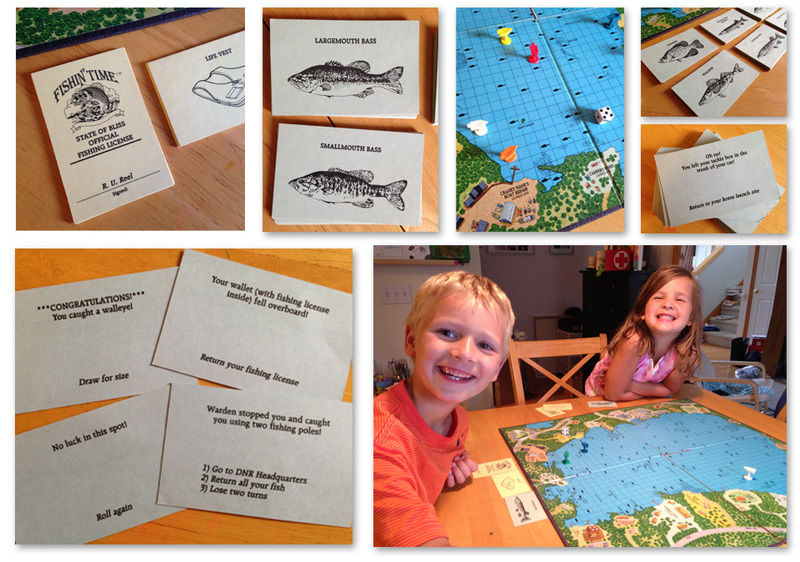 You move around on the board by rolling a dice and when you land on a fish you collect a Master Fishing card. Our son loves it and our daughter needs a little help reading the cards, but it is a super easy game with simple instructions and you can vary the game play to make it more challenging. I am sure this will be a hit in our family for years to come.